"This is an initiative that will save lives and restore the dignity of tens of thousands of our nation's children," President Cyril Ramaphosa said. Pit latrines are holes in the ground covered with a platform - and many are shoddily built. 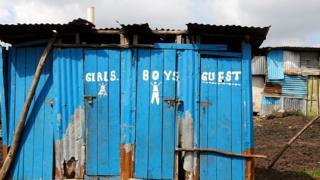 Why are children drowning in South Africa's toilets? Lumka Mkhethwa's death in March in rural Eastern Cape province came four years after another five-year-old, Michael Komape, had also died after falling into a school toilet in the northern province of Limpopo. The case in March led President Ramaphosa to launch an audit of sanitation facilities in the country's 25,000 schools. The Sanitation Appropriate for Education (Safe) programme will be funded in partnership with private groups including the Nelson Mandela Foundation and the UN children's agency (Unicef). "The Safe initiative reaches beyond the bricks and mortar of water and sanitation. It seeks to contribute to building a cohesive society in which schools are the heartbeat of wholesome communities," Mr Ramaphosa said. The cost of the ambitious project is estimated at 6.8bn South African rand ($477m; £ 375m), says the BBC's Pumza Fihlani in Johannesburg. This government estimate includes the demolition of existing structures as well as the building of proper toilets, our correspondent says.